Your residential search resulted in 10 properties found. Situated on a pleasant cul-de-sac on this much sought after development and enjoying a superb aspect beyond the good sized garden, a spacious 3 bedroom detached house with integral garage. Located off Hurst Meadow which is off Broad lane, the property is convenient for a number of primary and secondary schools including Crompton House School, buses and motorway access. The accommodation comprises: PORCH; WC with washbasin; DINING-HALL with open plan staircase; LOUNGE with stone effect Tudor style fireplace with open coal effect living flame gas fire and sliding patio door to garden; DINING-KITCHEN with limed oak style units, integral electric oven and gas hob; very spacious MASTER BEDROOM with beech style fitted furniture and EN SUITE comprising shower cubicle, WC and washbasin; BEDROOMS 2 & 3 with built-in cupboards above bulkhead of stairs; BATHROOM comprising bath, WC and washbasin. There is an integral single garage. The property is understood to be long leasehold subject to a ground rent of approx. ?50 pa; Council Tax Band D; uPVC double glazed windows; Gas central heating (combi-condensing boiler). An extremely well presented and extended 3 bedroom detached house with 2 reception rooms, breakfast-kitchen and large single garage with workshop/storage area. Enjoying a good sized and imposing corner plot within easy walking distance of primary schools and secondary school plus local amenities. Motorway and town centre are also within easy reach. Viewing is essential to fully appreciate. The accommodation comprises: PORCH; CLOAKROOM with modern WC and washbasin with tiled floor and walls; HALL with spindled staircase; spacious LOUNGE with window to front and sliding patio door to rear garden plus open coal effect living flame gas fire to surround; extended DINING ROOM with windows to front and side including porthole window; BREAKFAST-KITCHEN with attractive Shaker style fitted units, integral Belling double electric oven and gas hob, extractor hood and fitted breakfast table plus large walk-in STORE/UTILITY with plumbing for washing-machine; BEDROOM 1 with fitted wardrobes and cupboards; 2ND DOUBLE BEDROOM; 3RD SINGLE BEDROOM with fitted furniture; BATHROOM with modern suite comprising bath with electric shower above and shower-walling, WC and washbasin with vanity unit. The large attached extended GARAGE has a remote controlled roller shutter door, power, lighting and access to the garden. The property is long leasehold subject to a ground rent of ?50 pa; Council Tax Band D; Gas central heating (combi-condensing boiler); uPVC double glazed. A beautifully presented 3 bedroom detached house with 2 reception rooms, large conservatory, 3 good sized bedrooms, bathroom and shower room. Situated on a small cul-de-sac within a very short walk of Whittaker Moss Primary School, the property enjoys an attractive hard-landscaped south facing garden with workshop and 3-car width drive. Viewing is essential to fully appreciate the spacious interior of this delightful property. The accommodation comprises: uPVC double glazed PORCH with tiled floor; spacious LOUNGE with open plan spindled staircase, open coal effect living flame gas fire and laminate flooring; DINING ROOM with double doors from lounge, door to kitchen and double doors to the large CONSERVATORY which has a radiator, laminate flooring, French doors to outside and private aspect to rear; galley style KITCHEN with a good range of beech style fitted units, integral double electric oven, gas hob, extractor hood and space for additional appliances plus storage cupboard under stairs; MASTER BEDROOM with 2 windows to front, walk-in wardrobe and cupboard over bulkhead; BEDROOM 2 (double); BEDROOM 3 (good sized single); modern SHOWER ROOM with large shower cubicle (plumbed-in shower), WC, washbasin to vanity unit, fully tiled walls and floor; BATHROOM comprising bath with hand-held shower attachment, WC, washbasin to vanity unit, fully tiled walls and floor; LANDING with linen cupboard. EXTERNALLY, the block-paved drive will take 3 cars side-by-side; the rear split-level garden is fully paved for easy maintenance, enjoys a southerly and private aspect and has a concrete built workshop of 2.36m x 2.9m with power and light. Understood to be long leasehold subject to a ground rent of ?45 pa; Council Tax Band D; Gas central heating; uPVC double glazed. UNIQUE SPLIT LEVEL DETACHED HOUSE which has been INDIVIDUALLY DESIGNED built in the mid 1970's. 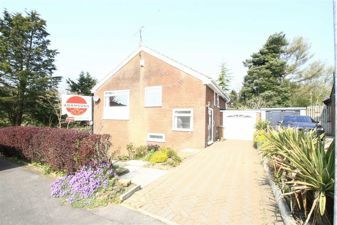 The property offers well proportioned family accommodation on a LARGE CORNER PLOT with the benefit of POTENTIAL TO EXTEND subject to planning permission. The property which has 3 BEDROOMS along with 2 SHOWER ROOMS, is surrounded by well established and kept gardens. Situated within the much sought after Marland District, close to all local amenities, well regarded schools and with excellent commuter access for the M62 Motorway Network. The ACCOMMODATION COMPRISES an ENTRANCE HALLWAY at gf level with staircase leading to the split level LANDING at the ff LOUNGE with excellent aspects and patio doors leading to Juliette balcony. KITCHEN with a range of fitted wall & base units, sdss, 4 ring hob, extractor over & built in eye level oven & microwave, integrated dishwasher and plumbing for automatic washer & dryer, integrated fridge/freezer. SHOWER ROOM/W.C with wash hand basin & double shower cubicle, splash back panelling & heated towel rail. To the LOWER GF the HALLWAY gives access to a W.C with wash hand basin. SHOWER ROOM with corner shower & 3 BEDS, the master with fitted robes. OUTSIDE there is a driveway providing off road parking leading to a single garage. The property is situated on a larger than average plot with garden areas to the front side and rear and paved patio/sun terrace to the rear. At the bottom of the garden there is an open brook which is maintained by the water board. The property is FREEHOLD. The property is heated via Gas fired warm air heating. D/G Windows. COUNCIL TAX BAND 'C'. EPC 'D'.